Complete your bedroom set with the stylish and glamorous Nightstand. The nightstand has two large drawers adding storage to your room. Detailed with embossed faux leather drawer fronts, stunning drop pulls and turned feet this is no ordinary nightstand. 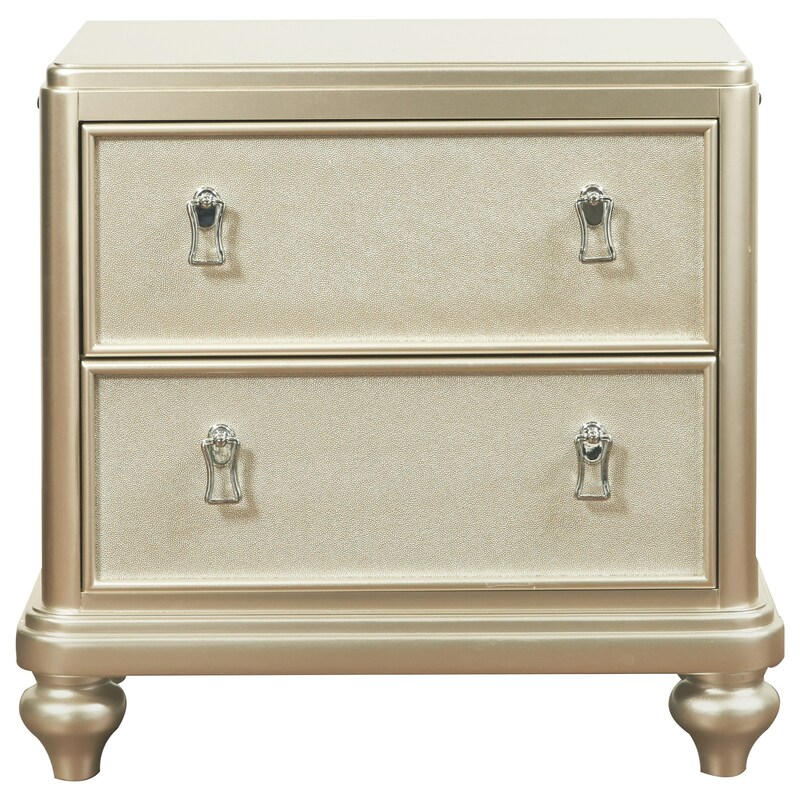 The Diva 2-Drawer Nightstand w/ Embossed Faux Leather by Samuel Lawrence at Miskelly Furniture in the Jackson, Pearl, Madison, Ridgeland, Flowood Mississippi area. Product availability may vary. Contact us for the most current availability on this product. Drawer / Shelf Construction English Dovetail drawer construction. Dust-proofed bottoms. Drawer Suspension Full-extension ball bearing metal drawer guides. Create a luxurious bedroom with the Diva Collection. Just like the name, this collection is nothing less than glamorous. 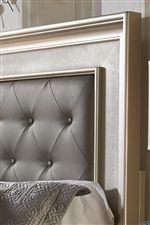 Faux embossed leather, jewelry inspired hardware, mirrored panels and a sleek platinum or bold midnigt finish makes this collection stand out in any bedroom. Choose between a variety of storage options including a lingerie chest, jewelry chest, a vanity and more. Each piece is constructed with birch veneers and hardwood solids. Quality craftsmanship is seen with canted and molded end posts, French and English dovetail drawer construction and full extension call bearing drawer guides. Bring the Diva Collection into your home and create and irresistible and stunning room. 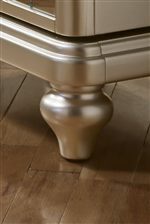 The Diva collection is a great option if you are looking for Glam Traditional furniture in the Jackson, Pearl, Madison, Ridgeland, Flowood Mississippi area. Browse other items in the Diva collection from Miskelly Furniture in the Jackson, Pearl, Madison, Ridgeland, Flowood Mississippi area.